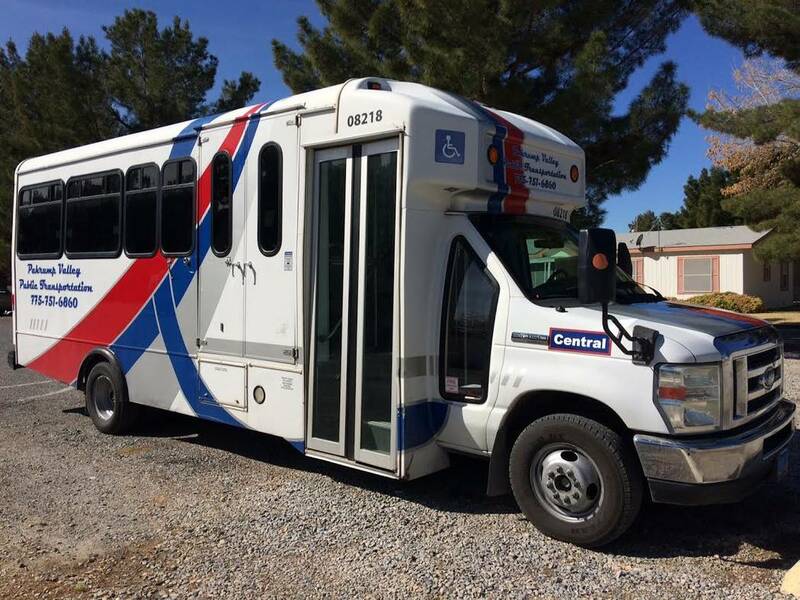 The Pahrump Valley Public Transportation system, more commonly known as the PVPT, is a brand new demand-response bus service operated through the use of grant as well as donation funding and it is now preparing for its next grant cycle. Robin Hebrock/Pahrump Valley Times The newest addition to the Pahrump Valley Public Transportation service is shown. This bus is dedicated to the central route while two others handle the northern and southern routes. 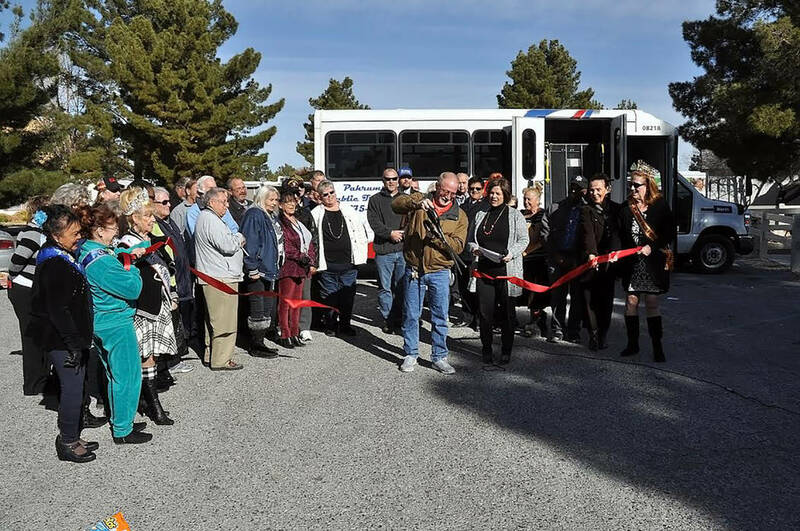 Horace Langford Jr./Pahrump Valley Times A large group of Pahrump residents gathered for the ribbon-cutting ceremony last month to celebrate the official hard launch of Pahrump Valley Public Transportation. The bus service, dubbed the PVPT, provides transportation Monday through Friday. 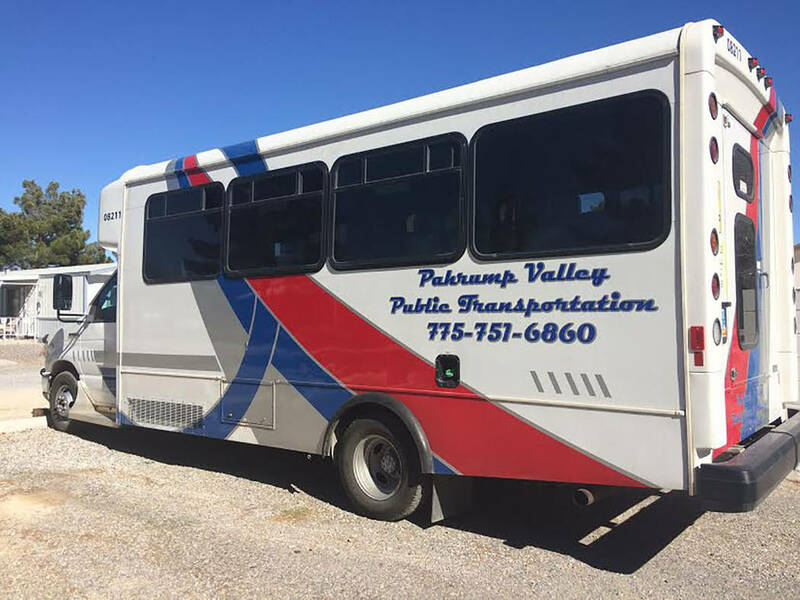 Robin Hebrock/Pahrump Valley Times The Pahrump Valley Public Transportation bus shown has recently been branded with the transit service's name and number, allowing residents to easily identify it when it is traveling around town. The PVPT is being operated by the Pahrump Senior Center, which last year secured a Nevada Department of Transportation grant that allowed it to expand its senior service to accommodate all passengers in the Pahrump Valley. PVPT operators are turning to the community for assistance in evidencing the value and necessity of the service in the coming grant cycle. Residents and businesses all across the valley have the opportunity to play a vital role in the process by penning letters of support to accompany the grant application and, if they are financially able, making a monetary commitment to aid with the required grant matching funds. With the April 16 application submission deadline only one month away, those willing to lend a hand are asked to submit their letters of support and financial pledges no later than April 9. It is not just residents that can help the PVPT with letters of support either. In addition to a statement of support, those who can contribute cash can also commit a specific dollar amount to the PVPT in their letter. This will help to pay the matching grant funds, which Whalen noted would be roughly one-third of the grant amount. Anyone wishing to provide financial assistance can submit a promissory note that states they are committing a certain amount which will be paid at the start of the grant cycle year. One-time donations are also always accepted. Whalen said that any form of support would be greatly appreciated and would go a long way toward showing NDOT that the PVPT is a valuable part of the community. The amount of grant funding to be sought in the fiscal year 2019 grant cycle has not yet been nailed down, as it fluctuates based on many factors. However, Whalen did disclose that he anticipated the amount to be significantly higher than last year, as the service is already blossoming and requiring more to operate. “That is due to the fact that we are operating three buses now and we are having weekend staff,” Whalen said. Letters of support and financial commitments can be submitted via email at ericwpsc@gmail.com or directly to the Pahrump Senior Center, located at 1370 W. Basin Ave. in Pahrump. For more information contact the PVPT at 775-751-6860. The PVPT may have officially launched only a few weeks ago but already the service is seeing enormous success. PVPT representatives have reported that the buses have been running at full capacity with demand so high that they are already preparing to expand the hours of operation. The PVPT is a demand-response bus service that picks riders up right from wherever they are in the valley and transports them to the destination of their choice. The buses are configurable to accommodate sitting, standing and wheelchair-using individuals and can be used for a multitude of transportation needs, including medical, shopping, personal and more. Fare varies based on the rider. For children under 12 years of age and those who can show their Nye County School District student identification card, a one-way ticket is $2. For seniors over the age of 60, a donation of $3 one way is suggested. For all others, the fare is $3 one way. The service currently operates Monday through Friday from 7 a.m. to 4 p.m. but as of Saturday, March 17, the PVPT will include weekend hours as well. Residents will be able to arrange for transportation on Saturdays and Sundays between 8 a.m. and 4 p.m.
To schedule a ride on the PVPT patrons must call 775-751-6860 by 1:30 p.m. and with at least 24 hours of advance notice.